It’s probably wise to remain a bit skeptical of travel writing. Not travel writers; just travel writing. Like kicking up silt in a still pond, travel stirs passions and romance which cloud objective view. It doesn’t take long at all to find a reasoned thought hard to come by. Not saying that’s a bad thing. In fact, we think it’s the natural result of finding yourself inspired. The result of spiritual appetites being satisfied otherwise dealing with familiar hunger. We relay some caution because, sitting down sit to write about our time at Channel Islands National Park, our memories of the challenges we faced are spiraling into obsolescence. Hasn’t even been a month, and our memory of cramped ferry rides has lost purchase. They’ve been replaced with a magnified picture of our daughter Ainsley, arms wide open, staring out over weathered canyons and brittle cliffs. If not for the little black notebook we jot in from time to time, we’d likely have already forgotten all but the most severe of our discomforts. In most circumstances, we’d be perfectly content to let the natural mind take its course but, we are putting ourselves forward as guides, and owe you and your family a complete and honest account. The National Parks are for everyone but, it’s true that some make that case better than others. If New Innocents was in the business of “rating” National Parks based on their accessibility to families with small children, we’d have to pass along that Channel Islands might be amongst your most challenging. But like Pappy always said, “No pain, no gain.” And your gain in this case is an unfettered peek at California as it once was. Your gain is a seat on a time machine. And unlike the slight disappointment you felt when you first stood packed in with six hundred people for a quick glance at the underwhelming Mona Lisa, you experience Channel Islands almost alone, on a prehistoric sentinel standing post off the coast of mainland America. It can be cold, windy, and even a bit dangerous. But, if you decide to hack it, a zoo of our world’s most interesting and delicate creatures will trice up and join you along the way. We visited a small fraction of Santa Cruz Island, which is only one of the five constituting Channel Islands National Park. To be fair, we HAVE to go back. Since we were on a weekend trip, we had to pick one island. Please consider this post one of several installments. Although travel to the islands is not easy or quick, we will definitely include the others in our future park planning. For this post, we’re happy to bring you the run-down on Santa Cruz, the island hailed as most “family-friendly.” Keep this in mind as you read, because each island is unique in its experiences, preparation requirements, and suggested stays. A weekend overnight camping trip. We stayed for only a day and immediately regretted it. The logistics associated with getting to the island make an overnight adventure the better option. NPS recommends a full weekend or day trips. I wouldn’t go so far as to say a day trip, “isn’t worth it” but, you’ll be totally zonked at the end of your day. On the advice of their public affairs team, we first booked the only available time slot for Saturday – our boat was to leave for the island at noon and return at 4pm. After talking it through, we decided four hours wouldn’t give us enough time to enjoy the hikes and take meaningful notes for our review. We ultimately decided to take a full day trip on Sunday leaving Saturday to explore the exhibits at the Visitor Center. Getting there happens in two parts. The easy part… and the not-as-easy part. Getting to the Robert J. Lagomarsino – Channel Islands National Park Visitors Center is a breeze. Dial [1901 Spinnaker Dr., Ventura, CA 93001] into Waze and it will handle it from there. Landed us at the center’s front door. Jen, Ainsley, and Clarke arrive at the Robert J. Lagomarsino – Channel Islands National Park Visitors Center. Once there, the not-as-easy part is getting to one of the islands. In our particular case, Santa Cruz. The only way to get to Santa Cruz is on an Island Packers chartered ferry. You’ll have to plan ahead with a visit to their booking website. Fortunately, the website is user-friendly and the Island Packers check-in office is just a short, very clearly marked walk from the park’s visitor center. I think they call it Island Packers because of the number of people per square foot they manage to “pack” onto their ferries. Saying it again…You absolutely have to book the boat ride ahead of time. Island Packers runs independent of the Channel Islands Visitor Center. Small boat approach to Scorpion Beach. If you plan to camp…same rules apply. Reservations can be made through www.recreation.gov and the NPS staff suggests calling the visitors center to confirm. It pays to plan ahead as the campsites are booked more than two months in advance. Following our movie refresher, Bryson gave Ainsley and Clarke the Junior Ranger low-down and invited us to his Tide Pool Talk. Ainsley watching Ranger Bryson feed the tide pool wildlife chunks of cut squid. If you have kids, the Tide Pool Talk should not be missed. We attended the 3pm talk and were treated to a discussion of the mock tide pool resident’s dining habits. The talk starts with the on-call Ranger literally pulling the spine from a “feed squid” and passing it to the confused audience members for inspection. The spectacle was entirely lost on everyone under the age of five. I’m convinced they thought they were holding a plastic wrapper. The school-aged types however (particularly those who’d had a physical science class or two) were mesmerized. All the more when the feeding began. Out came the scissors and chunks of squid were pinched into the pool. Ranger Bryson patiently fended off the repeated attempts of overly excited children to assist him in his feeding duties. Through the chaos, he somehow managed to leave everyone a bit more aware of the delicate balance which is the Channel Islands food chain. There will inevitably be one or two grown men more interested in the presentation than the children. They will do their worst to ensure your child’s attention span us fully taxed. Be patient and think of something else. To focus on their highjacking the discussion will only serve to put you in the foulest of moods. Hiking – During your ferry ride to the islands (whichever you ultimately choose) you’ll be joined by naturalists of the Channel Islands Naturalist Corps (CINC). The CINC is a joint venture between the National Park and Channel Islands Marine Sanctuary. The volunteer Naturalists are on station to explain what you’re seeing. To give you a more nuanced understanding of the beauty you’d otherwise be staring upon with a rather undistinguished open-mouth. During our ferry-ride, we met Gail. A volunteer with CINC, she walked around and introduced herself to all of the passengers. She told us she’d be leading a hike around the island and invited us to join. We jumped at the chance. Our family’s circus acts of whining for snacks and protesting sunscreen application could have easily scared off a less sturdy guide…but not Gail. As a trained middle-school science teacher, she’s mastered the art of dealing with humans infinitely more annoying than toddlers. She was a great sport. Our guided hike was perfect, well-matched to the attention span of a family with small children, and free-of-charge. We noticed Ainsley was hoofing it a bit to keep up but, never expressed discouragement. In all the excitement, we absentmindedly forgot to take a picture with Gail. Our only real regret of the trip. She was the perfect guide for our group, tailoring questions to younger ages and stopping to suggest a snack-break when Clarke grew restless while she was freeloading in her hiking pack perch. After a mile of fairly steep incline, the guided-hike ended atop the gusty peak of Cavern Point. Amazing views of Scorpion Anchorage and the coastline to San Pedro Point…But, the wind. Wow. Seems cliché to say “breathtaking” but it was so damn windy that we needed to get low and stay that way in order for Norah to breath normally and enjoy the view. After a few minutes of 30 knot winds, Gail left us to our own devices. We continued along the trail and stopped for lunch in an area protected from wind by some rocky outcroppings. Less breezy, we sat around for a leisurely lunch. We sat, laid around like sunbathing alligators, and let the kids run for over an hour. Once finished, we walked the rest of the trail. Steep but totally manageable. It needs to be separately mentioned that taking the hike with a guide was 100% the way to go. Other volunteers and Rangers offer similar hikes. Their perspective is priceless. We love hiking on our own, without having to consider other people’s intolerance for toddler shenanigans, but there’s no way we would’ve learned as much about Santa Cruz without Gail as our guide. She tipped us off to the sheer rarity of what we were experiencing. Among a countless number of other interesting facts, she turned our attention to an Island Scrub Jay. Evidentially, this bird is atop every “bird watchers” must see list. Without Gail, we would have been entirely oblivious. It’s worth at least one guided-hike. Perhaps venture independently from there. The Beach – We promised the girls swimming and fish sightings. Santa Cruz promises 30-knot winds. The water was cold. Supposedly in the low 60s but, felt much lower on account of the wind. Not brisk. Not refreshing. Not idyllic…Just cold as ice. That said, it’s a playground. You’ll walk the beachhead with more than a few hearty souls enjoying all manner of water sports. Diving, snorkeling, sea kayaking, etc. All can be enjoyed on Santa Cruz. You have to rent your gear and take it with you on the ferry but, the process is so finely tuned that you hardly even notice the twenty-foot hunks of hard plastic boarding the boat with you. For New Innocents, we sat the water excursions out…this time. Ocean Sightings – On the boat ride over, the Ferry Boat’s Captain abruptly came to “all stop” and slowed as we passed a buoy with no less than ten California Sea Lions using it to sunbathe. Guided Hiking Tours – Thanks Gail! Kayaking – We didn’t kayak but, if you have enough adults to stay back on rotation with the kids, or you have kids old enough to take out on kayaks, you have to do it! The cliffs and surrounding caves shouldn’t be missed! Camping – Should you venture to the islands for the weekend, you should pack about half of what you’d take on a “car camping” trip. Put another way, you should pack twice as much as you’d take on a through-hike. About a half-mile from Scorpion Beach, the campsites have a nice system of wheelbarrows to help you with the gear haul. The Views – The views, the views, the views. Looking out over the islands and Pacific, you feel like ole Leo and Kate on the bow of the Titanic…and based on the water temperature, might want to consider a similar risk of iceberg contact. The Scorpion Beach Pier – It’s damaged. It’s closure results in a less than optimal but, “adventurey” feeling small boat transfer. The process was seamless but not as convenient as a pier landing. Once in the Scorpion Beach Anchorage, we donned life jackets (yes, Norah too) and took a Rigid-Hulled Inflatable Boat onto the beach. We secretly dreaded this but, there was no need. The boat coxswains were great with the kids. It was clear they’d had lots of practice getting people ashore without getting their shoes wet. Recommend taking them off and carrying them anyway. Wet shoes are no fun. Wet shoes on kids are a deal-breaker. No Running Water or Amenities – Depending on which audience we’re talking to, this is either the highest of the highlights or a lowlight. For the purposes of traveling with small children we’ll call it a lowlight. There are a few outhouse-like toilets. Like we mentioned, we expected this, but it takes some preparing. They have two pump wells for potable water. Both are tested daily. We mentioned it in a previous post but this “wildness” also means no trash cans. Something considerable to plan for, because reusable plastic bags are banned on the island. We always just stuff our trash in a designated backpack pocket when hiking, but being there for an entire day –and thinking of those camping– we were mindful of the waste we were producing. We ended up storing our trash in an empty bread bag and carrying it back to the mainland in our pack. Return Trip – Through no one’s fault but our own, we almost missed the boat going back to the mainland. A complete rookie move. Despite our departure time being clearly marked on our tickets, we went the whole day thinking we were scheduled for a 5 vice 4pm departure. As we made our way to the beach an hour before we thought we were to take off, a Ranger approached us and asked if we were on the 4pm boat. “Nope! 5:00!”, we confidently replied. “Oh, you aren’t the Brown family?” Oops. Luckily, they waited for us and even took the careful time to go back and get an infant life vest for Norah. Missing Out on Kayaking – Definitely on our list to make up in the future, maybe once the girls are a bit better at swimming unassisted. No Real Medical Support – $10,000 helicopter ride to the nearest hospital. Please be SAFE. Not a place to overdo it. We brought our own food, obviously. A detailed list can be found below, where we discuss what we carried for the trip. Also worth mentioning, the boat has a galley and offers a lovely menu of Gatorade, chips and microwavable hamburgers. They also have coffee and beer. Please do everyone a favor and DO NOT order the burgers. Your international traveling companions are GOING to order the burgers as they think all burgers are created equal. Takes a refined American pallet to understand the esoteric world of grass vs. grain fed beef. The microwavable jobs will stink-up the cabin, virtually guaranteeing some poor chap’s rapid and untimely exit to the weather-decks for a bout of sea sickness. If you are camping, or would like to hike without hauling your gear, there are “Fox Boxes” near the beach to store your extra food. Yogi’s little protégés, Island Foxes are resourceful. They’re able to open buckles, zippers and coolers if it means an added snack. If they can’t get to what they’re looking for, they’ll solicit the help of the island’s gigantic Island Ravens! These “pterodactyls” are so enormous, we were keeping a closer than usual eye on Norah all day. Terrified one might swoop down and pick her up. Once you return to the mainland, there is a little seaside café where we stopped to refuel before the drive home. The Harbor Cove Cafe is a classic seafood shack…though a little pricey. For us the sticker shock was offset by the food’s freshness, the friendly staff, good location, and great views! Ounces = Pounds – We carefully planned for this trip. We knew we’d be without running water and any other amenities while on the island. We loaded up a day-pack’s worth of healthy food (whyyyy didn’t we take a picture of our stash?!) and flat Thermos icepacks to keep between the food and our Camelback’s bladder. Matthew carried Clarke in our Osprey Poco Plus, with the underneath compartment filled with our first-aid kit, one towel, five bathing suits, and a thin blanket. In the attached backpack we stored a change of clothes, extra sunscreen, diapers, wipes and medicine. We carry an EpiPen at all times along with Excedrin, children’s Tylenol or Motrin and children’s Benadryl. I carried Norah in the Ergo, with the front pocket carrying easily accessible sunscreen, back-up binkies and three inevitably discarded sun-hats. I also carried the Camelback backpack, which borrowing our friend’s “wit” have lovingly come to call the “Feed Bag”. In it, we packed individually wrapped pineapple spears (not very environmentally friendly but, a welcome treat on a long hike), cut-up strawberries and grapes, cereal bars, fruit strips, trail mix, no-nut peanut butter (huge fail), apple slices, dehydrated apple clusters (huge hit), a thin container with sliced cheese and turkey, crackers, and half a loaf of bread. The bread was a tad squished, but luckily, our kids don’t usually care what their food looks like…as long as it tastes good. Probably overpacked, but it was nice to feel a bit spoiled. This trip takes planning. You can’t just pick up and go due to the isolation and primitive nature of the island. You have to make reservations and be on time. But…it’s worth it! So incredibly worth it. It is easily one of our favorite National Park trips. Certainly among the most unique. Can’t wait to get another on the calendar. “The Fox” played in our heads all day. And now I’m sure the same is true for you. We’re are indeed sorry for that. Below, we’ve put together some cliff-notes on each of the islands. Paraphrased from the National Park Service’s more comprehensive reviews, this is a nice place to start if you -like us- want to jump on planning another adventure. 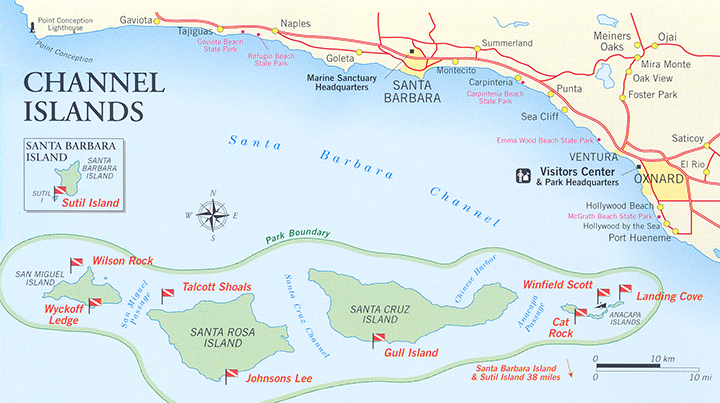 Anacapa Island: Half day, one day or short overnight. If you can only visit one island, this is the one you shouldn’t miss. Island Packers offers trips to the island: takes about an hour. There are only two miles of trails but the scenery promises to be worth it. Water access is only available by way of a dock, since the island is cliffside. NO food, water or services. $15 a night camping spots, 7 available. Santa Cruz Island: One day trip, short or long overnight camping. This is the easiest island to get to, has the best weather, and offers the most recreational activities. Island Packers offers trips to the island: takes about an hour. Water is available in one location. Has the most family-friendly camping of all the islands. Easy, sand and cobblestone beach access. Bird-watchers will be interested in the endemic island scrub-jay-only found on Santa Cruz Island and no other place in the world. San Miguel Island: One-day trips, multi-day boat trips, and overnight camping. Challenging to get to and very windy. A permit, liability waiver and extreme preparedness are essential. Island Packers offer trips spring through fall, trip is 4 hours. Channel Islands Aviation also offers flights. NO water, goods, services, Visitor’s Center or even picnic tables on the island. Where hiking is concerned, you can explore the two-mile long-Cuyler Harbor beach and one-mile-long trail to the ranger station on their own. To see other parts of the island, such as Point Bennett or the caliche forest, you must go with a ranger or volunteer. $15 per night, 9 spots available. Due to the boat schedule, minimum stay is usually 3 days. The long journey and intimidating weather are well rewarded as visitors get a chance to see one of the largest congregations of wildlife in the world-over 30,000 animals and up to five different species. Santa Rosa Island: One day trip, multi day boat trip or overnight camping. 3 hours by way of Island Packers, but weather can be very windy. Channel Island Aviation also offers routes. NO visitors center, goods or services but there is access to water. Several relatively flat trails. Camping available $15 per night, 15 spots available. Low profile tents a must due to very high winds. Watersports should be saved for only the very experienced due to the winds. Beach walking is a suggested activity. Limited accessible wildlife viewing. Previous Article: Blue Star Series – Point Mugu Navy Gateway Inn & Suites Review!